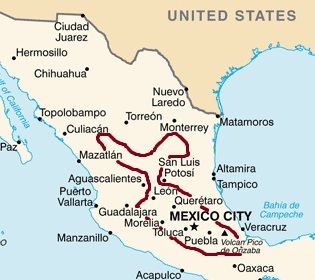 Mexico is a vast country and has different types of climate, however, it is generally arid on the west coast and in the central-northern highlands, it is moderately rainy in the mountain ranges and in the southern plateaus, while it's very rainy in some tropical southern areas. Summer is the rainiest season almost everywhere. The temperature increases gradually from north to south, to the point that the south has a purely tropical climate. Altitude plays an important role as well: there are many cities located at high altitude, including the capital, where the climate is cooler. During winter, the "Norte", a cold wind from the United States, able to cause sudden drops in temperature, can blow, especially in the center-north. Because of this wind, the northern inland areas (and a little less the northern coastal areas), during winter may experience cold waves, especially in hilly and mountainous areas. 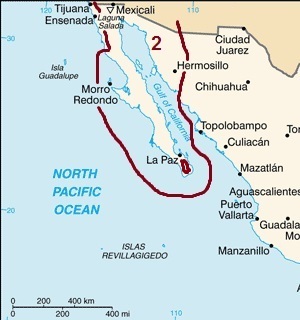 In the peninsula of Baja California, practically a continuation of California, the climate is very mild on the west coast, where daytime temperatures range from 19/20 degrees Celsius (66/68 °F) in winter to 24/25 °C (75/77 °F) in summer in the northern part. The sun shines throughout the year, and the rare rains fall from November to March; rainfall totals around 200/250 millimeters (7.8/10 inches) per year. Here too, as in California, a cold current flows, which makes the sea cool and causes a bit of fog, but in return it provides a lot of sun, little rain and a pleasant climate. However, when the wind blows from the interior, the temperatures can suddenly increase, even surpassing 40 °C (104 °F). 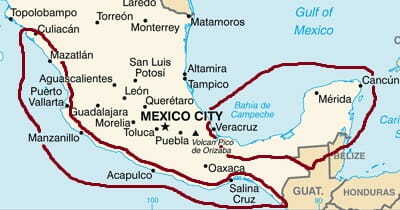 A city that is located in this area is Tijuana, just south of the border with the United States and a short distance from the greater San Diego area. Here are the mean temperatures of Playas de Rosarito, on the coast near Tijuana (in summer the city center of Tijuana is slightly warmer because of the distance from the coast). The rainfall in Rosarito is scarce and amounts to 260 mm (10.2 in) per year. It follows the Mediterranean pattern, in fact it is concentrated in autumn and winter. Here is the average precipitation. In this area, the sun shines all year round, although fog can sometimes form in spring and summer, especially in the morning. Here are the average daily sunshine hours in Tijuana. The temperature of the sea in this part of the coast is very cool even in summer, as we can see in the following table. Moving towards the south, the sea becomes progressively warmer. In the southern part of the state of Baja California, the sea temperature reaches 21/22 °C (70/72 °F) between August and October, while in the state of Baja California Sur, the sea is decidedly warmer. East of the coast, in the mountain ranges of Sierra Juárez and San Pedro Mártir, the winter temperature decreases with altitude, and there are frequent night frosts. On the contrary, owing to the distance from the sea (in which, as mentioned, a cool current flows), the summer is hot, although above 1,000 meters (3,300 feet), nights get cool. The Sonoran Desert, the westernmost of the Mexican deserts, is characterized by an increase in rainfall in the latter part of the summer, a kind of "little monsoon" from July to mid-October, which may bring some thunderstorms and an increase in humidity. 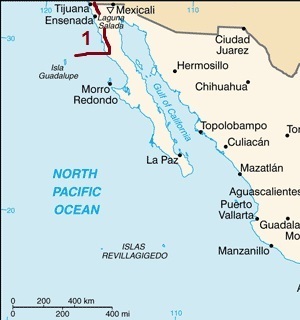 The central-southern part of Baja California (administratively divided in the states of Baja California and Baja California Sur) can be included in this area, although the climate is milder along the west coast than in interior and along the east coast overlooking the Gulf of California. In fact, continuing south on the aforementioned west coast, the temperature rises gradually, to the point that highs in Baja California Sur reach 20/22 °C (68/72 °F) in winter and 30 °C (86 °F) in summer in the northern part, and 25 °C (77 °F) in winter and 32 °C (90 °F) in summer in the far south. On the eastern side, the cold current doesn't arrive on the coast of the Gulf of California, and being that it's a closed gulf, in summer it becomes hot, and much hotter than on the western coast. Here, the daytime temperatures in summer are around 35/36 °C (95/97 °F), while in winter they are around 20 °C (68 °F) in the north, 22 °C (72 °F) in the center, and 25 °C (77 °F) in the south. Baja California is a barren, almost desert peninsula: along the coasts, annual precipitation is around 100/150 mm (4/6 in). But in the hills of Baja California Sur, the little monsoon brings additional rainfall, so much so that rainfall exceeds 400 mm (16 in) per year. This area, known as Sierra de la Laguna, is covered by woods (and therefore should be excluded from the desert area, as indicated by the small circle on the map). In the little monsoon season, from late June to October, and with a maximum in September, Baja California Sur (more rarely Baja California) can be affected by low pressure areas and tropical cyclones which form in the Pacific Ocean off the southern coast of Mexico. 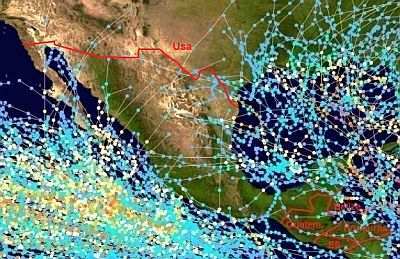 These disturbances, usually less intense than those that form in the Gulf of Mexico, can also penetrate the continent, affecting the northern part of the state of Sinaloa and the whole of the state of Sonora. Cabo San Lucas is located at the southern tip of Baja California. Here, as in the rest of the peninsula, the climate is arid; winter is sunny, with cool nights, around 12/13 °C (54/55 °F), and pleasantly warm days, around 26/27 °C (79/81 °F). Spring is warm and sunny: daytime temperatures reach 29 °C (84 °F) already in April. Summer is hot, with highs around 32/34 °C (90/93 °F), but in the second part, from mid-July to October, owing to the little monsoon, there's some chance of showers and thunderstorms, sometimes intense, especially in September. Here are the average temperatures. Since, as we mentioned, the rains are concentrated in late summer, in this southern part of Baja California the rainfall pattern is opposite to that of the northern part. Here is the average precipitation. The sun in Los Cabos shines all year round, but there's a certain decrease in the sunshine hours from July to September. Here the sea is very warm in summer, while in winter it is a bit cool, but not impossible for swimming. In the north-east of the state of Baja California, we find the Yuma Desert, where the town of Mexicali is located: it is an area of reclaimed lands and recent settlements, where the temperatures in summer reach extremely high values: the records are above 55 °C (131 °F)! This is the hottest place in Mexico as well as one of the hottest places in the world. Here are the average temperatures in Mexicali. Rainfall is very low, below 100 mm (4 in) per year, and the increase between mid-summer and autumn is barely perceptible. Here is the average precipitation. The sun in Mexicali reigns supreme all year round. Southeast of this desert, we find the Altar Desert, a sand desert whose appearance resembles the vast Saharan areas covered with dunes. The western area of the state of Sonora is part of the Sonoran Desert itself, and as we said with regard to Baja California Sur, it experiences an increase in precipitation from July to October. From July to October, the wet winds lower a bit the temperature, to the point that the hottest month is often June, but they also raise relative humidity in the following months. In this area, we find the important city of Hermosillo, which has a dry winter, pleasantly warm during the day (even though nights can be cold), and a very hot summer, with average highs around 40 °C (104 °F) in June. From July to October, the little monsoon brings some rains and thunderstorms, sometimes strong, which, however, do not last long, so that the sun will return after not long. The rainiest month is August, with almost 100 mm (4 in) on average. Relative humidity increases as well, going from 33% in June, to 55% in July, and to 51% in August and September, thus making the heat sweltering. Here is the average precipitation. In Hermosillo the sun shines all year round, however, as in Los Cabos, there is a slight decrease in the hours of sunshine from July to September. The mountain range called Sierra Madre Occidental, which separates the states of Sonora and Chihuahua, and continues south to the states of Sinaloa, Durango and Nayarit, experiences a period of monsoon rains quite long (mid-June to early October) and intense, so much so that precipitation exceeds 400 mm (16 in) per year (July is usually the rainiest month), so the climate of these mountains is semi-arid rather than desert. Above 1,000 meters (3,300 feet), rainfall is even higher, and it exceeds 700/800 mm (27/31 in), so the landscape is green. In the southern part of the Sierra Madre Occidental, even winter is quite rainy, and rainfall exceeds 1,000 mm (40 in) per year. 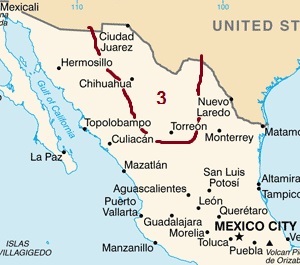 To the east of the Sierra Madre Occidental and to the west of the Sierra Madre Oriental, ie between the two ranges, we find the Chihuahuan Desert, an area dominated by highlands, and located in the states of Chihuahua and Coahuila and in north-eastern Durango. Here the climate is characterized by a wide daily temperature range, and also by a humid period from mid-June to mid-October, when the sun frequently shines, but it alternates with rains and thunderstorms. Winter is sunny and dry, with possible night frosts. 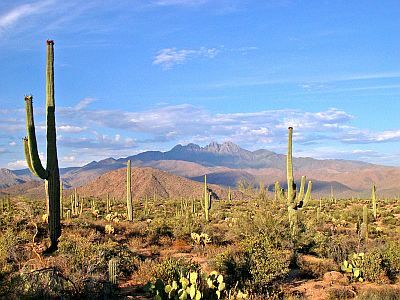 Summer is hot, but because of the altitude, the summer heat is less intense than in the lower areas of the Sonoran Desert. However, sometimes the temperature can reach or exceed 40 °C (104 °F). An important city of this region is Ciudad Juarez, located in the far north, at 1,100 meters (3,600 feet) above sea level, on the border with Texas. Here, the daily average temperature ranges from 7 °C (45 °F) in January to 28 °C (83 °F) in July. During winter, cold spells can be intense especially in the north: in Ciudad Juarez, the temperature can drop below -15 °C (5 °F) in the worst moments. Here are the average temperatures. Average annual precipitation in Juarez is 245 mm (9.7 in), with August as the rainiest month. Here is the average precipitation. In Ciudad Juarez, the sun shines all year round, but here too, as in the Sonoran desert, the sunniest month is June. Saltillo, 1,700 meters (5,600 ft), with an average temperature ranging from 12 °C (53.5 °F) in January to 23 °C (73 °F) in June, 370 mm (14.5 in) of rain per year, and September as the rainiest month. Here are the average temperatures of Torreon. 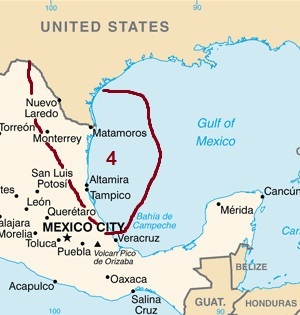 In the eastern area, overlooking the Gulf of Mexico (including the state of Tamaulipas, the east of Nuevo Leon, the south-east of San Luis Potosi, the north-east of Hidalgo, and the north of Puebla and Veracruz), along the coast, and in plains and hills below 500 meters (1,600 feet) of altitude, winter is very mild, sometimes pleasantly warm, but we can not exclude some short cold spells, while summer is hot and humid. Annual rainfall generally ranges from 500 to 1,000 mm (20 to 40 in) and increases gradually from north to south and near the highlands, where it even exceeds 1,000 mm (40 in) per year. The rainy period goes from June to October. In this area, we find the city of Monterrey, 500 meters (1,600 feet) above sea level and 280 km (175 mi) away from the coast, where the monthly average temperature ranges from 14.5 °C (58 °F) in January to 29 °C (84 °F) in July, and rainfall amounts to 590 mm (23 in) per year, including more than 50 mm (2 in) per month from May to October, with September as the rainiest month. Another city is Tampico, located on the coast, which has an average of 19 °C (66 °F) in January and of 28.5 °C (83.5 °F) in August. Here are the average temperatures. Tampico receives 1,150 mm (45 in) of rain per year, including more than 100 mm (4 in) per month from June to October. Here is the average precipitation. In Tampico, the sun does not shine very often in winter, despite the fact that it is the least rainy season, while in summer, apart from the tropical showers, the sun shines for a few hours a day. Near Tampico, the sea in the Gulf of Mexico is warm enough to swim in all year round, although in winter the water temperature drops to 23 °C (73 °F). 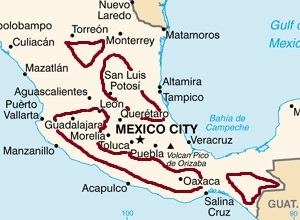 Let us now talk about central and southern Mexico, where the difference between winter and summer decreases because of the low latitude, and the temperature varies mainly with altitude; in this area, we can distinguish among the tierras calientes from sea level to 1,000 meters (3,300 feet), the tierras templadas between 1,000 and 2,000 meters (3,300 and 6,600 feet), and the tierras frìas above 2,000 meters (6,600 feet). In the plateau of the the center-south above 1,800 meters (5,900 feet), there is a considerable difference in temperature between day and night, especially in the dry season. The tropical sun's rays are very strong, even if the temperature is not so high. As for the rains, there is a dry season from November to April and a rainy season from May to October. The huge federal capital, Mexico City, is located in the southern part of the plateau, at an altitude of 2,200 meters (7,200 ft); administratively it belongs to the Federal District. Winter is dry and sunny, with cold nights. In January and February, lows are around 6/7 °C (43/45 °F), but sometimes they can drop a few degrees below freezing (0 °C or 32 °F), while days are pleasant, with highs around 21/23 °C (70/73 °F). In spring, the temperature rises gradually until April and May, which are the months with the highest daytime temperatures, around 27 °C (81 °F), while night-time temperatures are still pretty cool, around 11/12 °C (52/54 °F). In June, owing to the summer monsoon, which brings clouds and rains from June to September, the daytime temperature does not increase any further, in fact it drops by a few degrees, to around 23/24.5 °C (73/76 °F). In a typical year, 710 millimeters (28 inches) of rain fall, with a maximum of 160 mm (6.3 in) in July. The Mexican capital is polluted, and it's wrapped in an almost constant haze. Here are the average temperatures. In the areas of south-central Mexico that are located at intermediate altitudes, the average temperatures are mild, although sometimes it can get cold on winter nights, while sometimes during the day it can get hot. In this area, we can mention a city like Guadalajara, at 1,500 meters (5,000 feet) above sea level, in the state of Jalisco. Here the average temperature ranges from 17.5 °C (63.5 °F) in January to 25 °C (77 °F) in May. Here are the average temperatures. Rainfall amounts to 970 mm (38 in) per year, with a long dry period, and a rainy season from June to early October. Here is the average precipitation. The sunniest season in Guadalajara is spring, before the summer rains. In the southern highlands, the temperature is slightly higher and rainfall is more abundant, as happens in the highlands of Chiapas, where in addition, even October and November are rainy. In the plains and hills of the south, in the so-called Tierras calientes, the climate is hot all year round, with a dry season (December to April or November to May, depending on area) and a rainy season (May to November or June to October). The warmest period is the one that precedes the rainy season, usually the months of April and May. But later, with the arrival of the rains, the humidity increases, and so does the feeling of sultriness. Usually, the rains occur in the form of thunderstorms, sometimes strong, in the afternoon. In addition, the rains tend to become more abundant as you move south. In the interior of the southern states, precipitation exceeds 2,000 mm (80 in) per year, but in some cases it even exceeds 3,000 mm (120 in). The south of the state of Veracruz, the south-east of Oaxaca, the state of Tabasco and the northern part of Chiapas (see Palenque, Yaxchilan) are very rainy areas: here there are moderate rains even in winter, and therefore there is no real dry season. In Acapulco, along the coast of the state of Guerrero, the climate is hot all year round, but the dry season, from November to May, is sunny and it almost never rains. The sea is always warm, not going below 28 °C (82 °F) in winter. Here are the average temperatures. The mountains located north of the city protect this coast from cold winds (while this does not happen on the coast on the Gulf of Mexico, see below). However, in the rainy season, from June to October, the rains are abundant and sometimes torrential. Here is the average precipitation. As mentioned, in Acapulco the sun shines more often in the dry season, from November to May. Here, and in general along the southern coast of Mexico, during the rainy season, tropical cyclones can form, called cordonazos, which are able to cause gale force winds and heavy rains. Traditionally, El cordonazo de San Francisco is a storm that occurs on October 4, i.e. the day of St. Francis. Further north, in Puerto Vallarta, in the state of Jalisco, the climate is similar to that of Acapulco, but winter nights are cooler, and they can occasionally get pretty cool, around 10 °C (50 °F); this can still happen, though more rarely, in March and April. The sunniest season in Puerto Vallarta runs from February to May, before the summer rains. The sea in Puerto Vallarta is warm enough to swim in even in winter, since it doesn't go below 24 °C (75 °F). In the east, in the Yucatán Peninsula (in the states of Campeche, Yucatán and Quintana Roo), the climate is generally warm to hot all year round, but winter is not as dry and sunny as on the south coast: the months of December and January, when highs are around 28/30 °C (82/86 °F), are quite rainy; in addition, from December to March, sometimes the cold wind from the United States, the Norte, can blow, and in these cases, the minimum temperature can drop to 10 °C (50 °F) or even below. In Cancún, the least rainy period runs from February to April, and the driest month is April, so it is an advisable destination for the Easter holidays, when the Norte is less likely to blow. The Gulf of Mexico in Cancun and the Riviera Maya is warm enough to swim in all year round. The rainy season runs from May to November and is a hot and sultry period. The rains are abundant especially in June, and between September and mid-November. However, the sun still shines quite often, in fact the rains generally occur in the form of downpours or thunderstorms, so they don't last long. A similar situation is found in Isla Mujeres and the Mayan Riviera south of Cancun (see Playa del Carmen, Tulum, Cozumel, etc..): here, March and April are the driest and sunniest months, and April is the best month. During the rainy season, the Yucatán and the coastal area bordering the Gulf of Mexico can be affected by hurricanes, especially in the period from August to October; however, the hurricane season runs from June to November. Hurricanes come from the south or east, and sometimes can be destructive. In the high mountains and volcanoes of south-central Mexico, the climate is Alpine, although, given the low latitude, this happens at very high altitudes. For example, on the Nevado de Toluca volcano, southwest of Mexico City, at 4,300 meters (14,100 ft) above sea level, the monthly average temperature ranges from 2 °C (35.5 °F) in January to 5 °C (41 °F) in April and May, which are the warmest months. Here are the average temperatures. The rainy season runs from May to October, and July and August are the rainiest months, but with these temperatures it can snow even in summer. Here is the average precipitation. The three highest volcanoes of Mexico, Citlaltépetl, Popocatepetl and Iztaccihuatl, exceed 5,000 meters (16,400 ft), and at the highest elevations, perennial glaciers are found. As mentioned, Mexico may be affected by tropical cyclones, either by those coming from the east, i.e. from the Caribbean Sea and the Gulf of Mexico, which affect the east coast and the Yucatán, and by those that are formed on the Pacific and affect the western and southern coasts. The hurricane season runs from June to November, although they are more likely from August to October. Cyclones can penetrate inland for many kilometers (or miles), even though they tend to weaken as they move away from the sea. In the following image, we can see the trajectories followed by the tropical cyclones that have affected Mexico from 1980 to 2005 (the dots refer to the eye of the cyclone, so the affected area is larger). The best periods to explore the northern regions of Mexico (coasts and deserts) are spring and autumn, in March-April and September-October, and in particular, you can choose October. In the tierras frìas too, spring and autumn are the best periods, even though the main purpose in this area is to avoid the summer rains; therefore, you can also avoid the month September, which is still a rainy month. You can go to the tierras frìas in winter as well, bearing in mind that it can get cold at night. You can go to the tierras calientes from December to February, to avoid both the heat and the rains of summer, and because in some areas the months of October and November are still very rainy. In spring, in April and May, the rains have not arrived yet, but the weather is usually hot. As regards to the sea, the southern coast (see Acapulco) is warm and sunny in winter (eg Christmas and New Year), with a warm sea, around 28 °C (82 °F), so it's recommended for a beach holiday. The good season in Acapulco is long, from November to April. The coasts of the Gulf of Mexico and Yucatán (see Veracruz, Cancun), do not have an ideal climate in winter, at least for a beach holiday: the sky is often cloudy, sometimes it can rain, and the Norte can bring a bit of cool weather. Spring is a better season, from March to May, with a preference for April: in March, sometimes a bit of cool air can still arrive, especially in the first half of the month, while in May it begins to get hot, with the first thunderstorms. Spring is fine also in Cabo San Lucas and the southern part of Baja California. On the northern coast of Baja California, where the air is mild even in summer, you can sunbathe, even though the water is quite cold. In winter: for the Chihuahuan desert and the mountains, bring warm clothes, a jacket, a hat, gloves. For Baja California, the eastern plains and the tierras templadas, bring clothes for spring and autumn. For Mexico City and the tierras frìas, bring clothes for spring and autumn during the day, but also a warm jacket and a hat for the evening. For the highest mountains, bring warm clothes, such as a down jacket, gloves, a beanie. For the tierras calientes, light clothing, a sweatshirt for the evening in Yucatan and Riviera Maya. When going to the reef, you can bring snorkeling equipment, including water shoes or rubber-soled shoes. In summer: bring light clothing, sunglasses, sunscreen, a light raincoat. For the Chihuahuan Desert, add a sweatshirt for the evening. For Mexico City and the tierras frìas, add a sweatshirt or sweater for the evening, a jacket and an umbrella. For the highest mountains, warm clothes, a warm jacket, a wind jacket, gloves, a hat, hiking shoes.